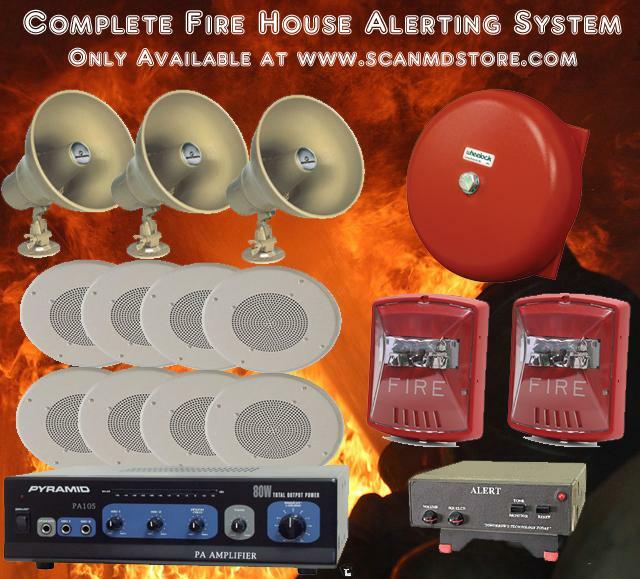 The ScanMD "Complete Fire House Alerting System 14" Comes with everything you need to install your very own fire house alerting system from scratch (tools not included). This system is powered by a Veetronix Tone Alert Reciever w/Dual Relays to control the Bell and Strobes, also provides your audio output into the included 80W PA Amp. The PA Amp powers the included 8 ceiling speakers and 3 Bay/Outdoor PA Speakers. The dispatch audio can be programmed to always be on or on after an alert for a preset amount of time and then reset. The system is full of options and I will be more then happy to answer any questions or design a custom system for your department. Feel free to contact me at 240-431-1159. Please Allow 2-3 Weeks for Delivery after cleared payment.